Conrad Bain, Mr. Drummond On 'Diff'rent Strokes,' Dies : The Two-Way He was the kindly white adoptive father of two young African-American brothers on the popular TV series, which aired from 1978-86. Bain, 89, died Monday in California. The show made Gary Coleman a star. He died in 2010. 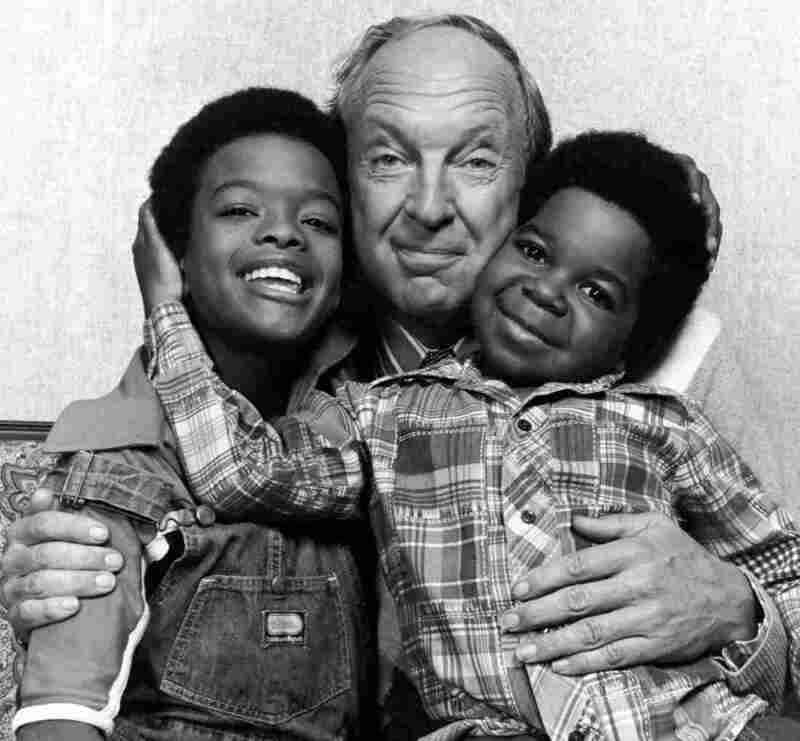 Conrad Bain, with actors Todd Bridges (left) and Gary Coleman (right) in 1978 when they were starring on Diff'rent Strokes. He'll always be best known as "the kindly white adoptive father of two young African-American brothers in the TV sitcom Diff'rent Strokes," as The Associated Press writes. Conrad Bain, 89, died Monday in Livermore, Calif., his daughter says. Born in Alberta, Canada, on Feb 4, 1923, along with twin brother Bonar (who TMZ.com says survives), Bain began acting while in high school. After service with the Canadian Army during World War II, according to IMDB.com, he studied at New York's American Academy of Dramatic Arts. Stage work led to some daytime drama roles in the 1960s — on Dark Shadows and The Edge of Night. But in the early '70s, IMDB writes, "he broke completely away from the usual dramatics ... when he was offered a co-starring role opposite Bea Arthur and Bill Macy in Norman Lear's liberally-sliced comedy series Maude. ... [Bain] played Rue McClanahan's stuffy, conservative doctor/husband, Arthur Harmon, who usually was at political odds with the free-wheeling feminist Maude." That role led to the chance to be Philip Drummond in Diff'rent Strokes. The show was a hit and stayed on the air from 1978 to 1986. The Drummond character "promised his dying housekeeper he would raise her sons, played by [Gary] Coleman and Todd Bridges," the AP reminds us. "Race and class relations became topics on the show as much as the typical trials of growing up. People writes that Bridges, and especially Coleman, were scene stealers. In real life Bain, his daughter Jennifer tells the magazine, "was a lot like his character in Diff'rent Strokes. ... He had that warmth and stability. He also was a very intellectual person." Jennifer Bain also tells People that her father died of natural causes. ABC News' Celebrities blog reminds us after Diff'rent Strokes ended, "the young child stars led troubled lives." Dana Plato, who played Drummond's daughter, "died in 1999 of a prescription drug overdose at age 34. Coleman died in 2010 at age 42 from a brain hemorrhage after years of financial and legal troubles. Bridges, 47, has turned his life around after struggling with drug addiction and facing criminal charges. Last year, he split from his wife of 14 years." After Diff'rent Strokes, Bain had a role in the short-lived TV series Mr. President and, IMDB writes, appeared in the 1990 film Postcards from the Edge. It was "an engaging scene as a befuddled grandpa opposite the perennially crusty Mary Wickes." Fans of a similar program, Webster, will recall that the kindly adoptive father from that show — actor/football great Alex Karras — died back in October.